Arthur Feinsod has been waiting decades for the right moment to bring "Awake Sing!" to the stage. Lucky for Feinsod, he found just the right political climate and cast of talented Indiana State University students to bring the play to life in 2016. "This is a play whose time has come, because theater has to be significant. It's not decoration. And this play allows us to go to the significance of what theater can be," said Arthur Feinsod, Indiana State professor of theater and director of "Awake and Sing!". Clifford Odets' masterpiece, set in the Great Depression, is a coming-of-age story about Ralph Berger and his education at the feet of his free-thinking idealistic grandfather. Rejecting the hard-nosed pragmatism of his mother and uncle, Ralph comes to learn that an alive life requires bold, unconventional choices, not depending on other people's opinions or views of success and not allowing life to be "written on dollar bills." "I saw this play performed at Harvard when I was a 19-year-old student, and I fell in love with it. It is so poetic but hard-hitting, and that is a challenge for me as the director and them as the actors," Feinsod said. "It's a careful balancing act, but I want the audience to be speechless just like what happened to me when I saw it performed as a student." 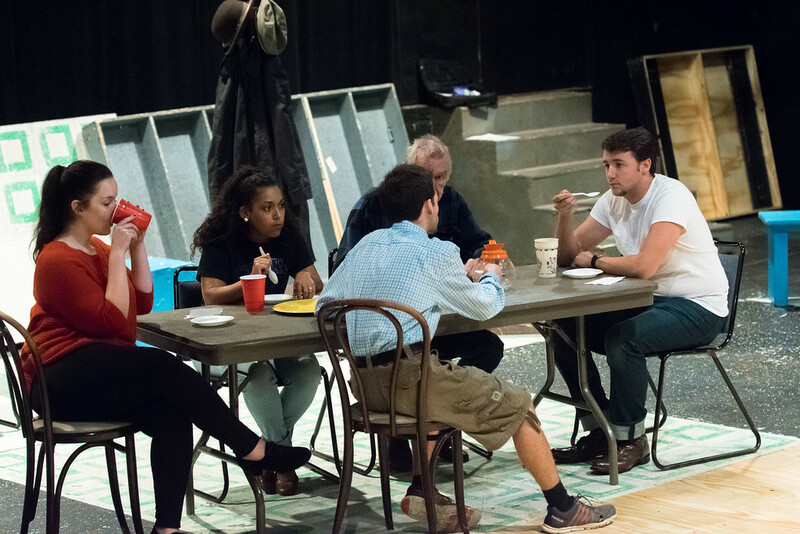 After casting the show early in the fall semester and rehearsals starting in September, Indiana State will bring Odets' play to live on stage of New Theater on the Indiana State campus, 7:30 p.m. Nov. 9-12 and 4 p.m. Nov. 13. "This performance is high stakes for me," said Ally Miles, a junior theater major from Terre Haute who will play Hennie Berger, who finds herself with an unwanted pregnancy and arranged marriage. "I performed in ‘The Lonesome West' with Crossroads Repertory Theatre and am now in the middle of my college experience and want to do what's right by Arthur, Odets and the cast." Feinsod said the play has always spoken to him and he's helping bringing it to life for his students of a very different generation. "I'm from the generation that came to consciousness in the '60s and has gone through the cynical '90s," he said. "But seeing how Bernie Sanders has connected with this younger generation and the idea that your success should be determined not by what people want but what you do has resonated with me." Maybe the most challenging part of the play for a cast of mostly Midwest students is pulling off a believable New York accent. "I decided we had to do it, so I became dialectic coach - along with being the director - so everyone in the cast would be able to perform using a strong New York accent," said Feinsod, who used his experience growing up in a Jewish home in New York suburbia to show the cast how it's done. "I thought about taking the accents out, but when you hear the play performed without the accent, it seems strange." "Sometimes people go to the theater just to be entertained, but I don't want them to recede into complacency. I want them to see merit of the words we say," Schmit said. "There's no apathy with this cast, and everyone's in the right role. We're all on the same page on what we want to accomplish, which can be rare. It's been electric and it feels good, so I'm soaking it all in. This is an opportunity, as aspiring actors, to hone our craft in one of the greatest American plays. It's just a beautiful work." Schmit, a junior theater major from Danville, Ill., hopes the audience listens closely to the dialogue, including that of his character Moe Axelrod, a friend of the Berger family who eventually boards with them. "Awake and Sing!" may be the one of the greatest productions Indiana State has ever performed, Schmit added. "There is a political awakening in our country, especially with this generation of college students," he said. "It's an awakening that has not been just been political but also spiritual, and this show is all about the world we live in and what it means to seize the opportunity of life." Tickets are $10 for general admission. Rush tickets (free) are offered to students 90 minutes before the show. Reservations are not accepted. All tickets must be paid for when requested. Ticket Office will open on Monday at 12 p.m.. Ticket Office hours are 12-4:30 p.m. and one hour before the performances. 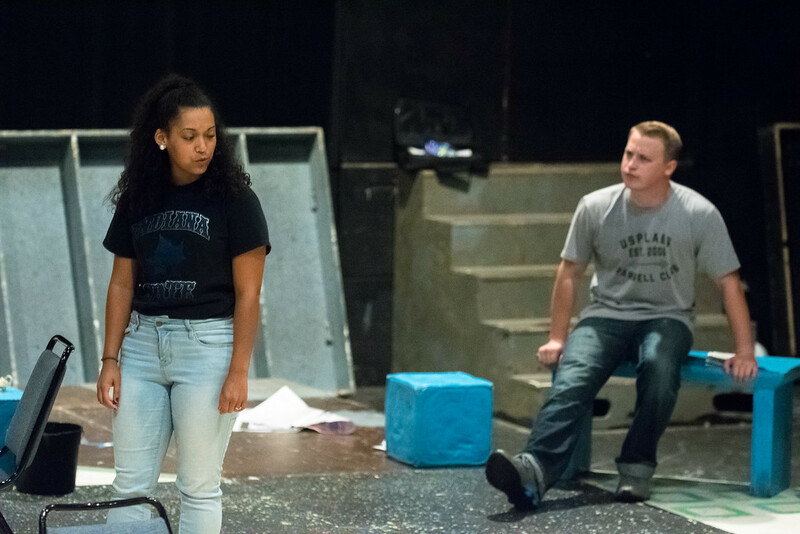 Photo: https://photos.smugmug.com/Events/Events-by-Year/2016/Awake-and-Sing-Rehearsal-2016/i-MRLf8HF/0/XL/AwakeandSing_Garcia-43-XL.jpg - Indiana State University junior theater majors Ally Miles, left, of Terre Haute, and Maverick Schmit, of Danville, Ill., rehearse for the upcoming performance of "Awake and Sing! ", which will be featured in New Theater, Nov. 9-13. Photo: https://photos.smugmug.com/Events/Events-by-Year/2016/Awake-and-Sing-Rehearsal-2016/i-2h4P9sq/0/XL/AwakeandSing_Garcia-1-XL.jpg - Actors rehearse for the Indiana State University theater department's upcoming performance of "Awake and Sing! ", which will be featured in New Theater, Nov. 9-13. The Indiana State University theater department will perform "Awake and Sing!" in New Theater, Nov. 9-13.